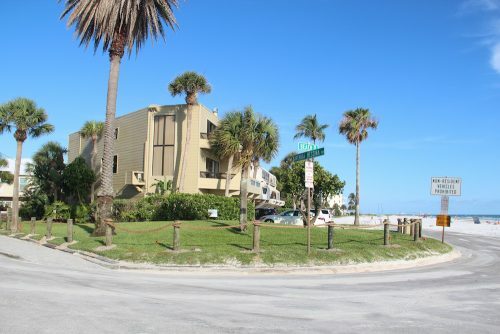 A regular beachgoer reported to SNL/Siesta Sand the first week of June that a rope-and-post system had been installed on what appeared to be county right of way at the intersection of Avenida Messina and Beach Road, at Beach Access 2. A photo of the situation was sent to Sarasota County staff, asking for a determination of whether the project indeed was encroaching on public right of way. Yes, it is, Ashley Lusby, the Emergency Service Department’s media relations officer, confirmed in an email. “Staff will be contacting the owner to get it removed,” she wrote on June 12. Lusby, by the way, has been assisting with media requests since county Media Relations Officer Jason Bartolone began working in a similar capacity with the City of Sarasota on April 25. On another note, SNL/Siesta Sand did observe that the grass around the structure at the corner of Avenida Messina and Beach Road appeared to be flourishing. Earlier this year, Sgt. Jason Mruczek, leader of the Sheriff’s Office substation on the Key, fielded complaints at Siesta Key Association meetings about large numbers of partying young people at Beach Access 2 at night.